Alison's signature paintings of interiors are created in situ to maximise her experience of a room. She uses the pages of interior magazines as her ground on to which she will paint and score her collaged 'paper'. Her strength is to seek out a place in each room that has a special interest, a strongly lit corner, a window, a striking architectural detail, pulling us into the room that she sees. Her first experience of a room is paramount, she wants to be able to observe it, breaking it down into a series of abstract shapes and colours so that she can build her collage. In doing so she will often turn the pages of the collage upside-down or vertically to get the desired shape and tone in just the right place. The paint is applied very sparingly, allowing the images below to shine through, becoming part of the work. 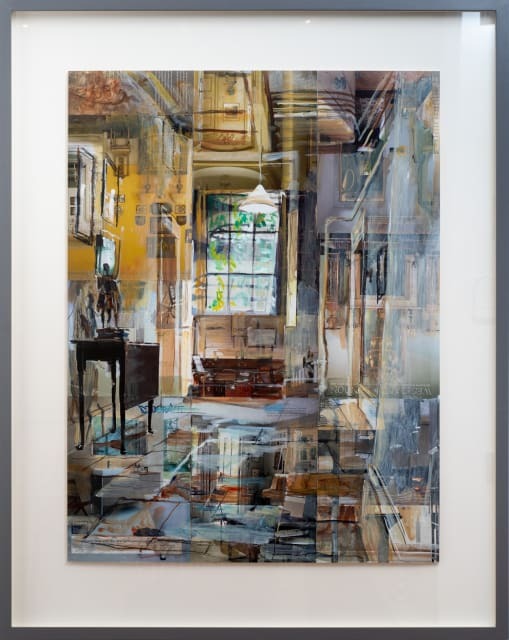 The result is an ethereal, semi-abstracted work which seems to melt together, the details of the room emerging with each viewing, as if we are travelling through it ourselves. Alison Pullen studied at the Royal College of Art and her work has taken her to residencies at Osterley Park House in West London, Christchurch College and the Bodleian in Oxford, as well as the Royal Hospital Chelsea. She has completed numerous commissions, including one for the HRH The Queen who commissioned paintings of The Throne Room at Buckingham Palace. Alison's paintings are represented in collections in the UK and internationally. She has exhibited at Sarah Wiseman Gallery since 2006 and has had two solo exhibitions at the gallery during that time.